2018 sees both 37215 and D6948 in action over the festive period. D6948 will be working the diesel diagram on the green timetable on Boxing Day 26th December and on New Years Day 1st January covering 56 miles each day with its steam boiler providing heat for the train. (See the Roster page for full details of the booked trains). D6948 will be joined by 37215 during the 'Christmas Cracker' mixed traction event on the 29th/30th December. More details can be found on the GWR website here: https://www.gwsr.com/Christmas_Cracker__29__30_December--post--61.html The loco roster for both locos can be found on the roster page on this (Growler Group) site. The Group’s AGM will be held on Sunday 8th April in the meeting room at the rear of the Flag and Whistle cafe at Toddington Station (known as 'The Boardroom'), commencing at 11:00. All members are welcome and indeed encouraged to attend. It is your Group and it’s a great opportunity to meet the committee, ask questions and find out what is happening. This is the re-arranged AGM postponed from 2nd March. 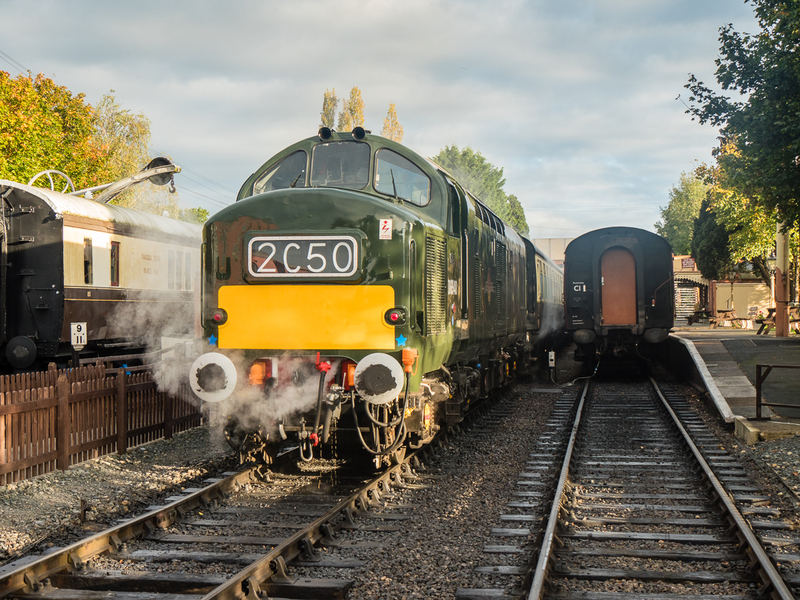 Both D6948 and 37215 will be out working the GWR's Green Timetable diesel hauled diagram on Saturday 28th October comprising the 1110, 1330, and 1555 Toddington-Cheltenham Racecourse, and the 1205, 1425 and 1640 return from Cheltenham. The locos will operate in top and tail formation throughout the day in order to keep things nice and warm using the steam heat boiler in D6948. So if you fancy a steamy day out in the Cotswolds and a sight like this, please come along and support the Group by riding on the trains!